Informal institutions of theological training, called schools of the prophets, proliferated in New England in the late 1700s. These schools not only allowed for the growth and spread of the New Divinity movement, they went on to monopolize theological education for over 50 years. The Reverend Charles Backus opened one of the more prodigious schools of the prophets in Somers, Connecticut. The term school of the prophets had been used in New England to refer to most institutions responsible for training clergy. During the late 18th century, however, it became associated primarily with alternative schools that arose to provide clerical education to men of the New Divinity movement. New Divinity followers were largely New England Congregationalists who associated themselves with theologian Jonathan Edwards and the Great Awakening, a period of evangelical Protestant revival. They wanted to update their traditional Puritan teachings to be more reflective of their modern-day lives. Unsatisfied with the religious training found at such prestigious schools as Yale and Harvard, New Divinity men opened schools of the prophets to ensure that future religious leaders received what they believed to be truer preparation for the ministry. 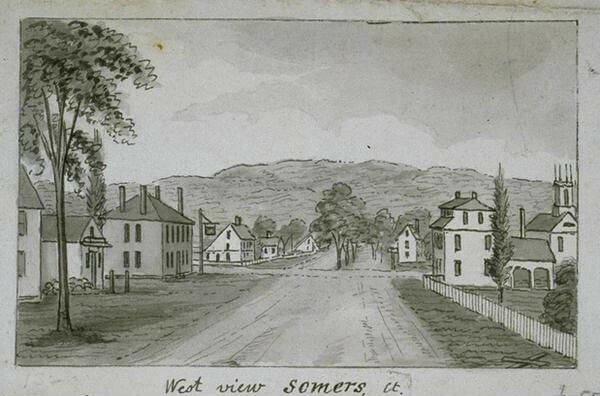 In Somers, Reverend Backus, who had received his training at Yale College, began instructing young men in the 1780s. He trained approximately 60 ministers, making his the fourth-largest school of the prophets in New England. Students in Somers studied theology for 13 to 18 hours per day. 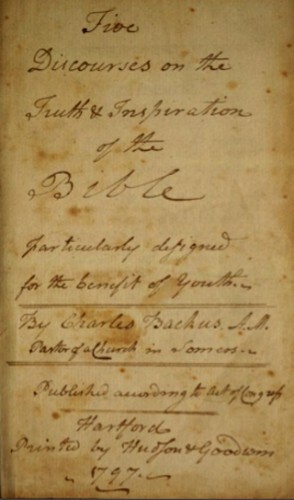 In addition, Backus provided opportunities for students to interact with prospective converts in the community, preach in nearby churches, and speak at weekly conference meetings in which they read selected bible passages aloud for the edification of parishioners. At the time Backus’s death in 1803, there were schools of the prophets operating throughout Connecticut in places like New Haven, Preston, Goshen, New Britain, and Washington. During the short life of the school of the prophets in Somers, Backus turned out some of the Northeast’s most important religious and educational leaders, including the future presidents of Hamilton, Williams, Amherst, and Middlebury colleges. Backus, Charles. Five Discourses on the Truth and Inspiration of the Bible: Particularly Designed for the Benefit of Youth. Hartford, CT: Hudson & Goodwin, 1797. Link.